In the 1950s and 1960s, the world watched as the USA and USSR raced to reach the moon. The USSR had some early accomplishments, launching Sputnik 1 in 1957 and Vostok 1 with Yuri Gagarin in 1961. In 1969, Apollo 11 launched and Neil Armstrong and Buzz Aldrin were the first men to walk on the moon. Since then, space exploration has taken a much more cooperative approach. The ISS is a joint project between five space agencies, and astronauts from 15 different countries have inhabited it in its 14 years. In Twin Spica Volume 1, the history of space exploration has played out a little differently. Here, in 2010, Japan's JAXA space agency launched its first all-Japanese shuttle into space. But 72 seconds after takeoff, critical systems failed and the shuttle crashed back to Earth. Beyond dealing a near-fatal blow to Japan's nascent space program, debris from the shuttle landed in a small tow, killing or injuring many civilians. 14 years later, Asumi Kamogawa is taking her first steps towards space herself. The astronaut program at Tokyo's space school is finally accepting new applicants, and Asumi has secretly applied. It's only herself and her father at home, and she doesn't want to worry him with tuition or boarding fees, since he works double shifts as a construction worker to make ends meet as it is. But in the tradition of good fathers everywhere, he might have an idea or tow as to how to help his little girl achieve her dreams. Upon arrival at the space school, entrance testing continues. Her first day at school, she's locked into a room with two other girls and assigned a seemingly impossible task to accomplish over the next three days. While one roommate, Kei Oumi, is outgoing and nice enough, the other, Marika Ukita, is a quiet, sullen girl who doesn't seem to speak but to criticize. But learning to work together in a closed environment is just another lesson to be learned in the course of becoming an astronaut, and Asumi will do her best at this, too. Asumi has another person in her corner on her way to the stars. At age 6, her mother died after being in a coma since The Lion's failed launch. While dealing with the death of the mother she never really knew, she meets a spirit who calls himself Mr. Lion. With astronaut pants and the head of the Lion mission's mascot, he keeps Asumi company through her rather lonely childhood. Like many Vertical titles, Twin Spica is a slower paced, contemplative story. Current-day chapters are followed by chapters that give us a look into our characters' backstories. 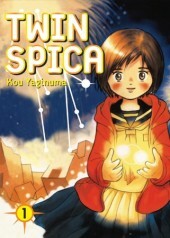 Covering topics ranging from lost loves to a parent's devotion to his child, to following one's dream no matter where it takes one, Twin Spica is a touching story that nearly anyone can relate to. Highs: Fathers often aren't portrayed well in the media, but Asumi's dad shows what it means to work every day for your children. Lows: Hopefully we'll find out more of how Asumi grew up and got to this point. Verdict: Perhaps not to the typical shonen manga reader's taste, Twin Spica shows a lot of heart and more real emotion than many manga.